So, I work at this cafe we have in the back of my yoga studio a few times a week, and once a week we make salmon. 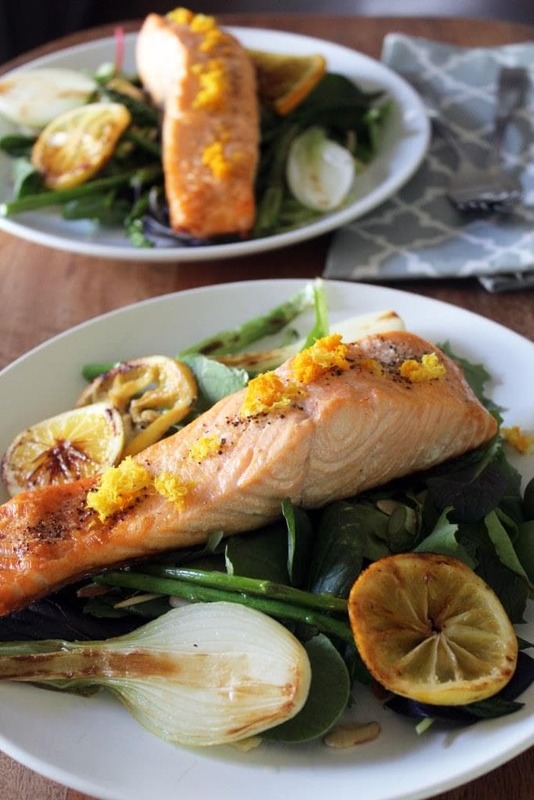 It’s really a salmon salad with a lemon vinaigrette and some nuts and feta and all kinds of stuff, but this week I was just THINKING SALMON, and I never eat the salmon we cook because we sell it so fast, so I hiked my booty to the grocery store, bought some effing salmon, and citrused it UP, yo. You don’t understand the grilled citrus. Can’t stop won’t stop, all that stuff. I love every single thing about this salmon, and Jay likes every single thing except the olives, which is fine because I ate his. Fair, yes? 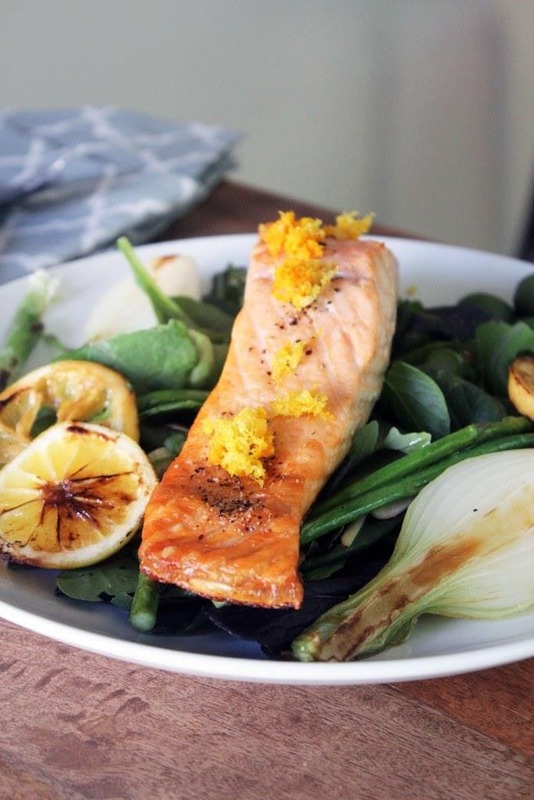 The method for cooking the salmon basically ensures juicy flaky fish, and the citrus zest on top at the end? Fresh and clean in a non dirty way. 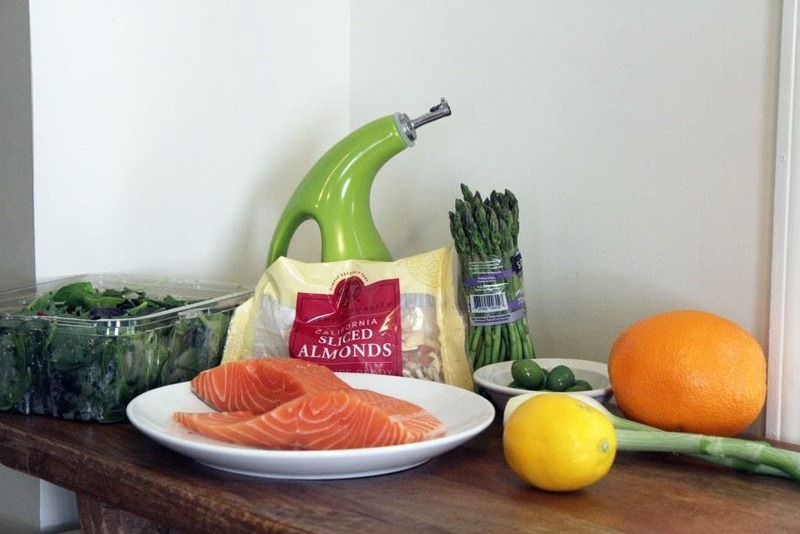 You just need salmon, salad greens, an orange and a lemon (I used meyer but please don’t get all weird an think that a regular lemon isn’t as good), olives if you like ’em, green or spring onions, asparagus, almonds, and olive oil. 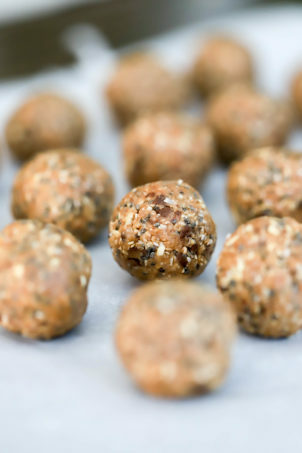 Really simple and delicious stuff. And the lemon! 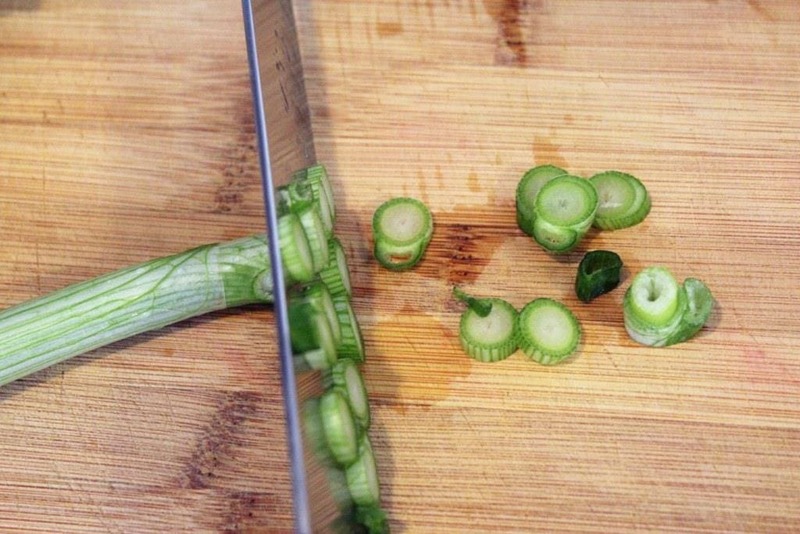 We’ll use the zest later on. Then, halve the citrus and slice HALF of each one. Basically we’re going to grill all of the citrus, but we’ll squeeze the halves over the salads for dressing, and eat the slices because yum. Then, let’s start the salmon. 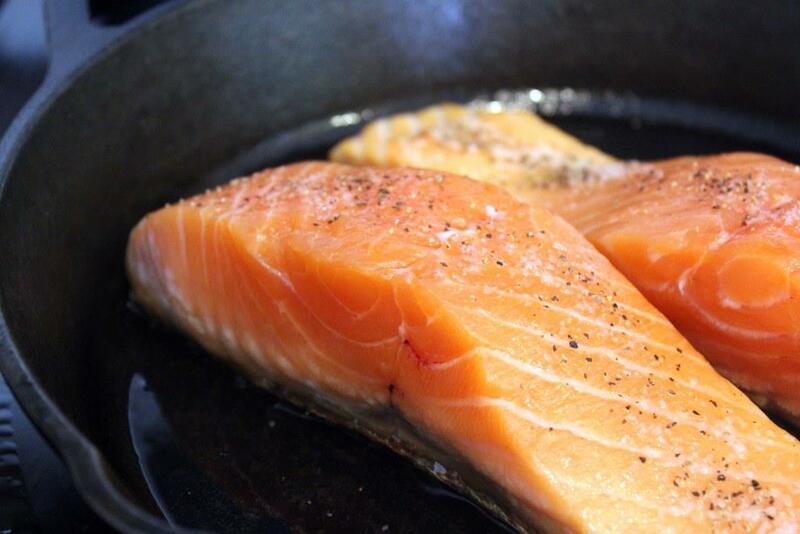 To a cold oven proof pan (cast iron is ideal, but most other skillets can go in the oven too) with a drizzle of oil, add the salmon with a sprinkle of salt and pepper. Turn the heat to medium-high. Preheat a second skillet with some olive oil at this point, as well. AND, preheat the broiler. With the salmon, we’re going to cook it on just one side in the skillet, then transfer it to the oven to finish under the broiler without flipping it. So, cook the salmon until it starts to sizzle. 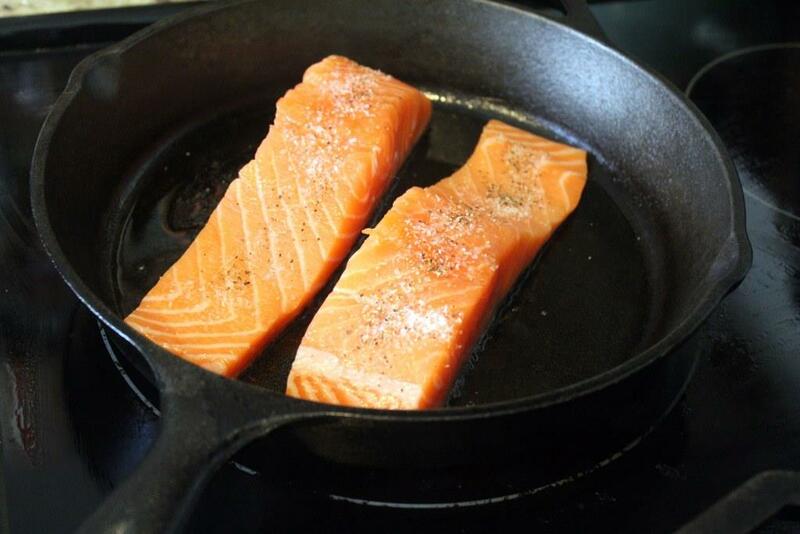 The salmon will gently heat through and start to cook from the bottom up as the skillet heats up. 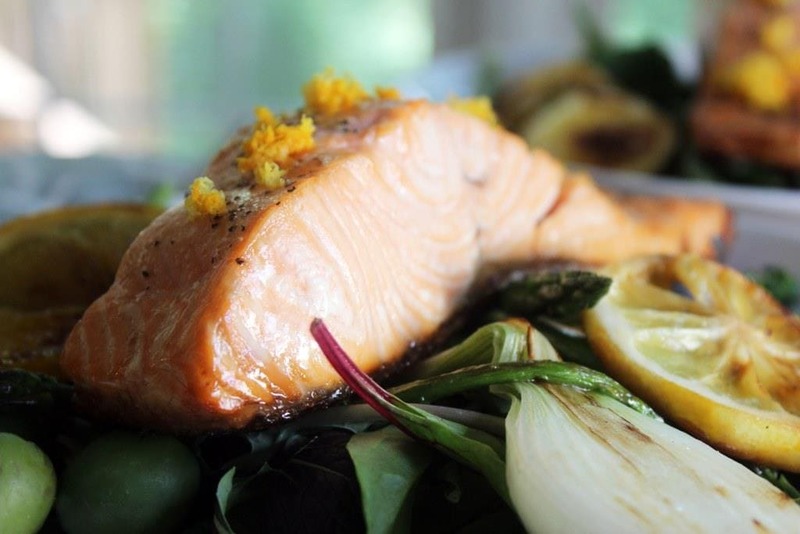 When you can see that the bottom of the salmon has started to cook, after about 7 minutes (beginning with the cold skillet), transfer the salmon to the broiler. Broil the salmon for just about 4 minutes until the top is barely golden and the center of the salmon is still medium. The bottom of the fish should be crispy and the top will be soft but cooked. 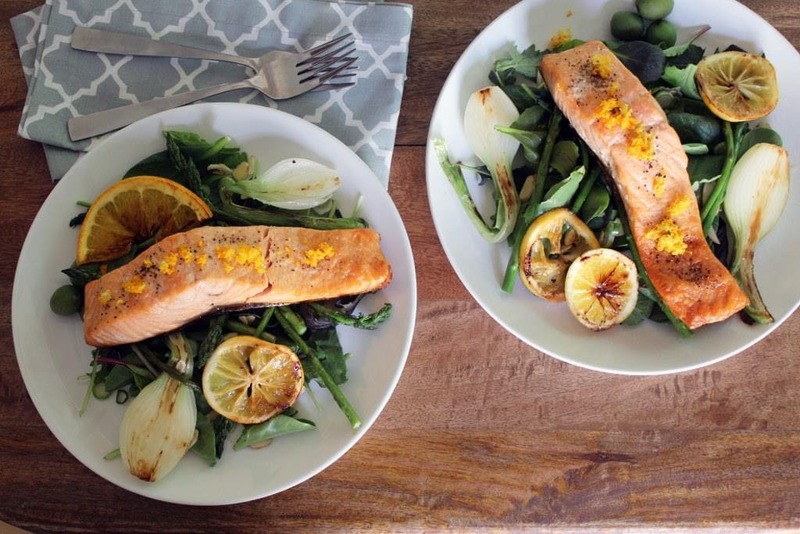 As a note, I did this while I was making the rest of the salad, but you can cook the salmon like this FIRST, and let the salmon rest for a few minutes while you do the rest of the salad. Up to you and how many things you’d like to juggle at once! Now, onto the rest of the salad! 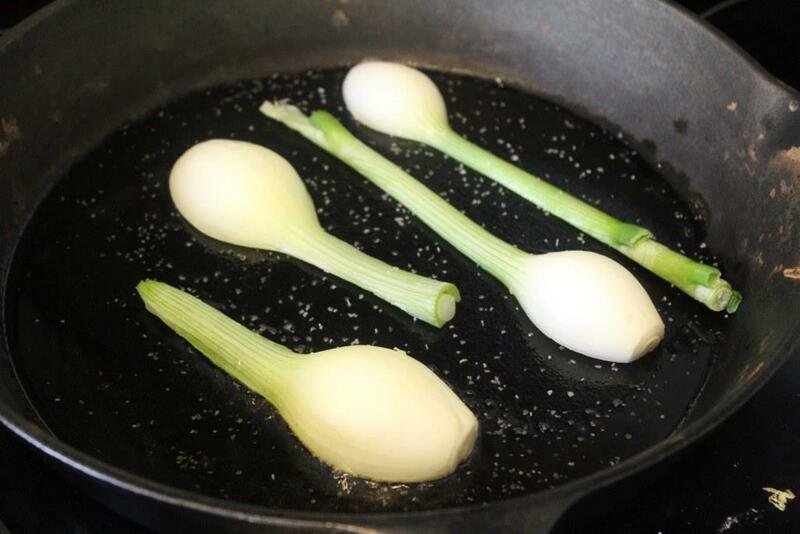 If your spring onions have long tops, thinly slice them to use for garnish, then halve the onions. When the non-salmon skillet has preheated for about 5 minutes, add the spring onions. Cook the onions for about 2 minutes on each side until browned but not totally mushy. Then, remove the onions from the skillet. 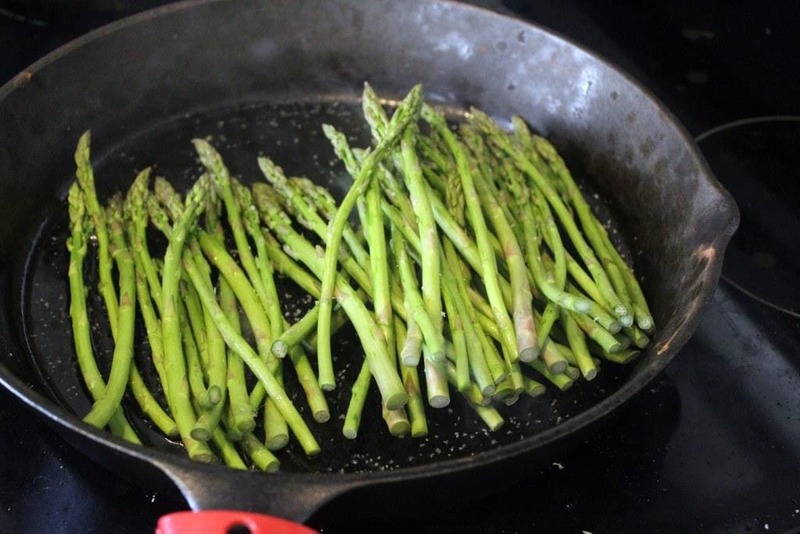 To the same skillet, add the asparagus with a sprinkle of salt. Then cook in the same way! Just a few minutes to get a little bit of char, then remove to rest. Now, onto the citrus! Add the halves and the slices to the same skillet. After about a minute (maybe sooner if your pan is really hot), check to see if the first side of the citrus is charred. Look, yes! 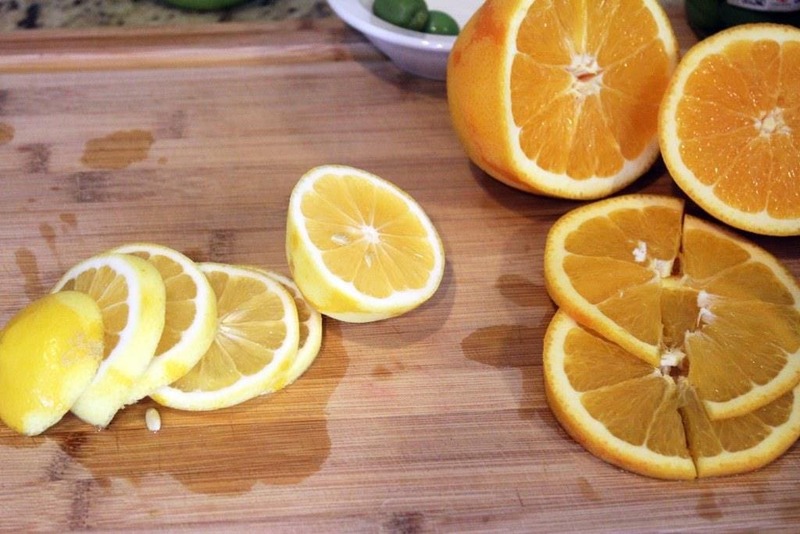 At this point, flip the citrus slices to let them brown on the second side, and remove the halves to cool. Turn the heat off the skillet. At this point we should have lots of salad stuff all ready to go, AND some lovely salmon to go over top. Let’s make our salads! 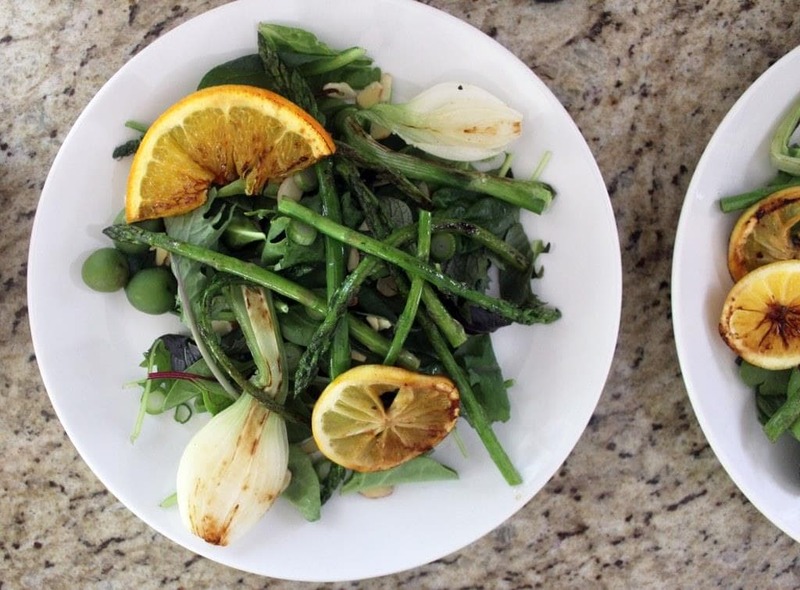 Dish up some greens, almonds, onion tops, and olives to each plate. 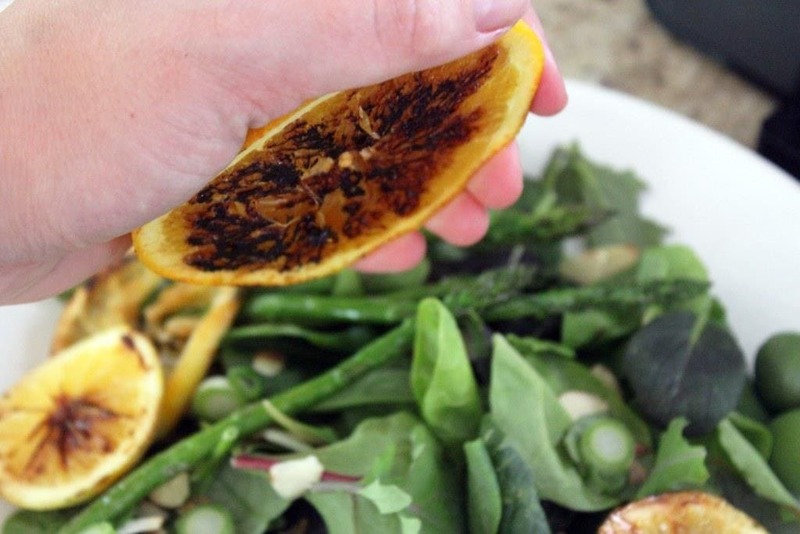 Then add some of the pretty grilled citrus slices, asparagus, and spring onions to the salads. Now, instead of a dressing we’re just going to use the citrus halves we grilled, mmkay? 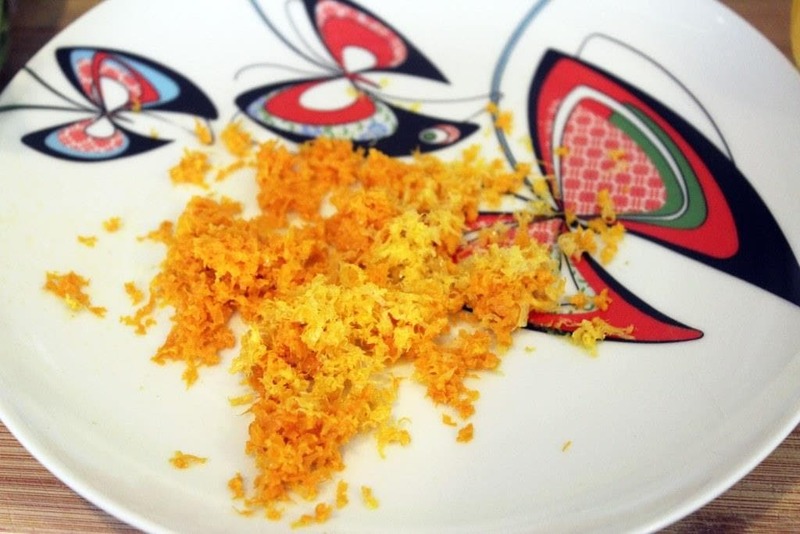 So, squeeze a big of the orange and lemon juice directly over each salad, drizzle with olive oil, and sprinkle with salt and pepper. This is really the best dressing in the world without actually making any dressing. 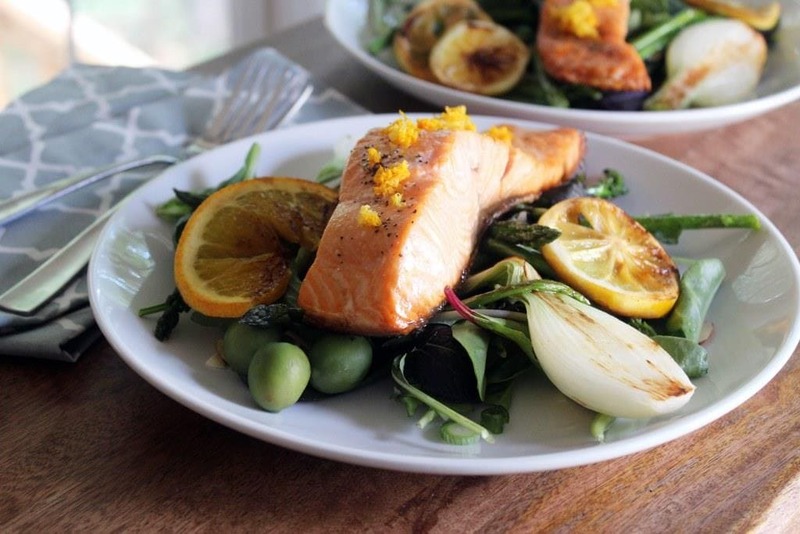 Now, all that’s left is to add a piece of salmon to each salad, and top THAT with some of the lemon and orange zest for some freshness. This is the new salad of your dreams, friends. You are going to absolutely adore it, and UGH the salmon. I love this method for cooking fish, especially when it has the skin on it – the fish turns out perfectly without being over cooked. 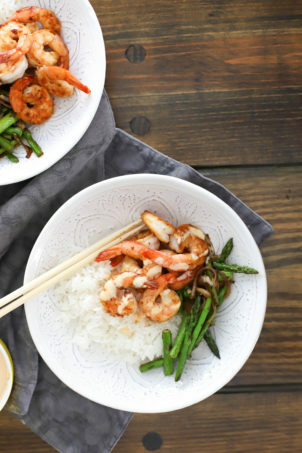 Make this soon, and CELEBRATE spring and summer flavors! 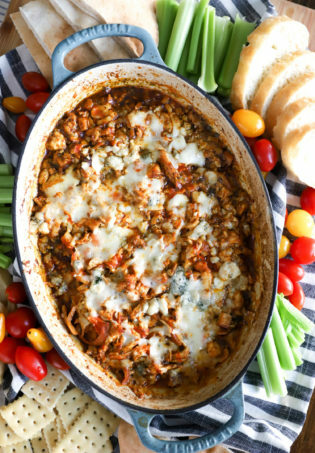 Preheat the broiler to high and turn 2 skillets to medium-high heat with a drizzle of olive oil. Sprinkle the salmon with salt and pepper. 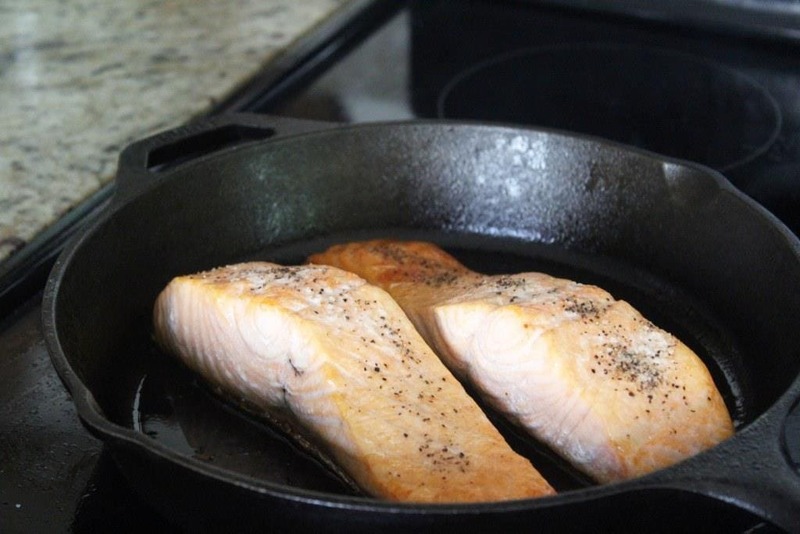 Add the salmon skin-side down (if your salmon has skin) to the cold skillet, and let gently cook on just the skin side for about 7 minutes until the skin is crispy and the flesh has started to cook on the bottom side of the salmon. Transfer the broiler until just barely browned on top, about 2 minutes, and the inside of the salmon is still slightly rare. Let cool while you prepare the rest of the salad. 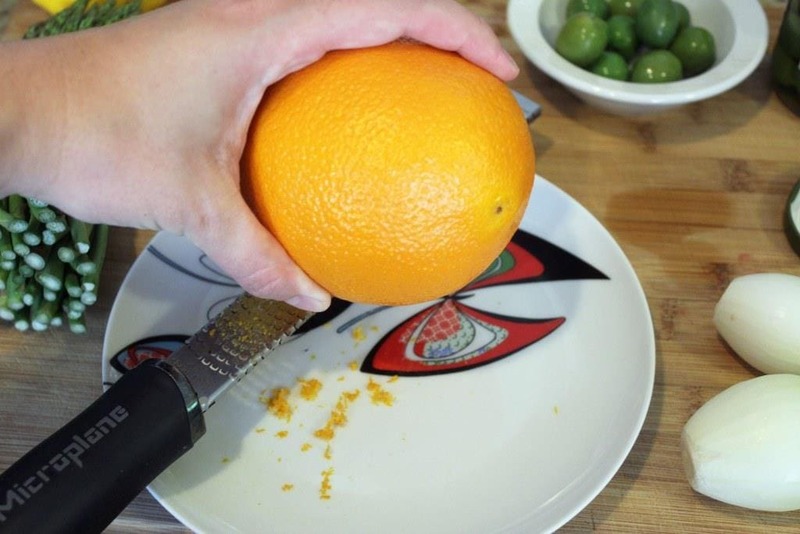 Slice half of the lemon and orange, and leave the other half of each fruit whole. Meanwhile, in the second skillet, add the onions and sprinkle with salt. 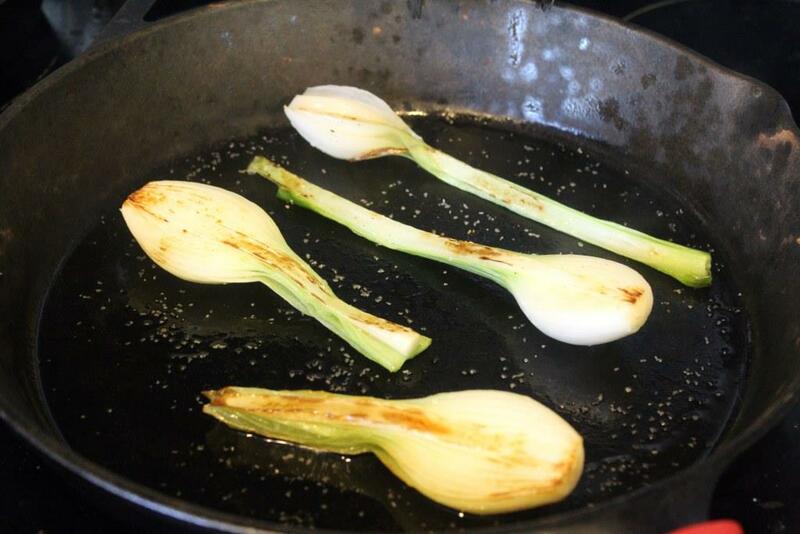 Sear on both sides for about 90 seconds until the onions are charred, then remove to a plate. 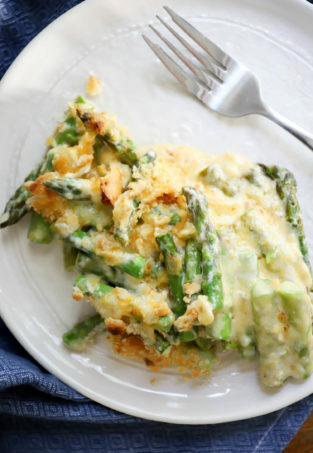 Repeat with the asparagus, and let that rest. 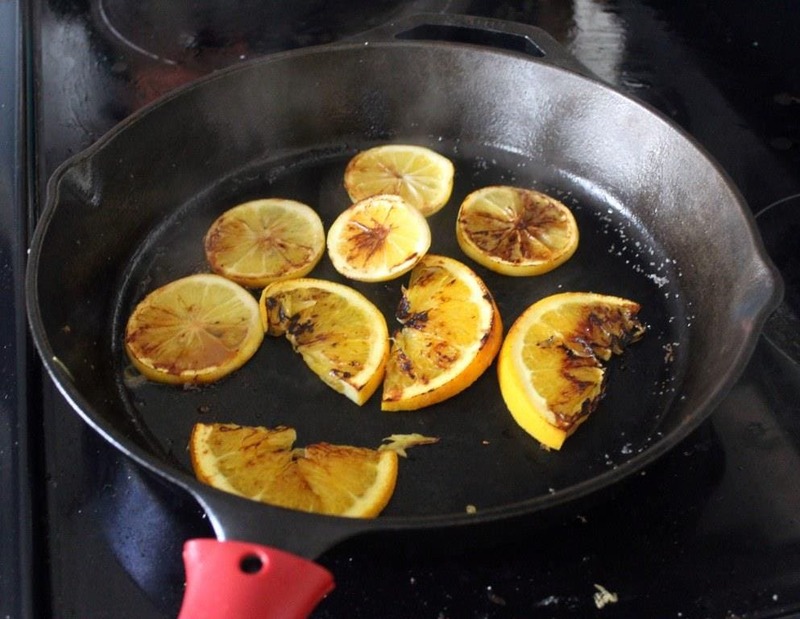 To the same skillet, add the citrus halves and slices. Sear on both sides of the slices and just one side of the halves until browned, then remove to a plate and turn the skillet off. 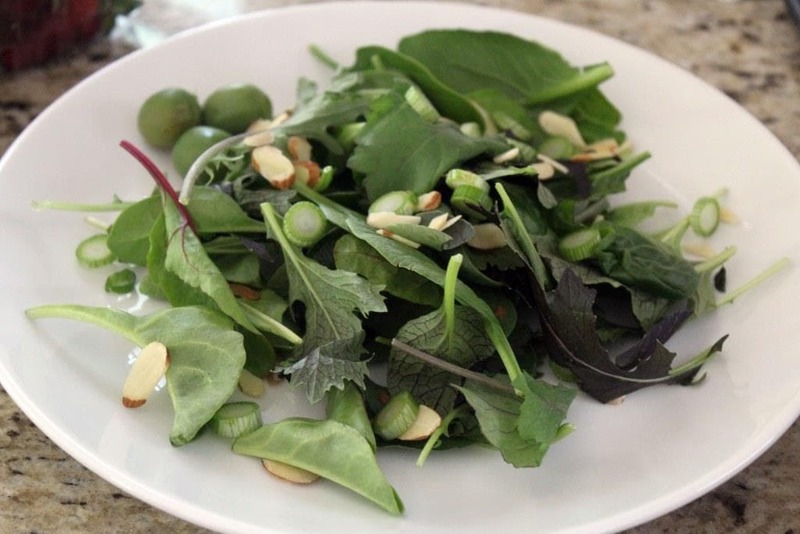 To assemble the salads, arrange the greens, asparagus tips, onions, olives, and almonds on a plate. 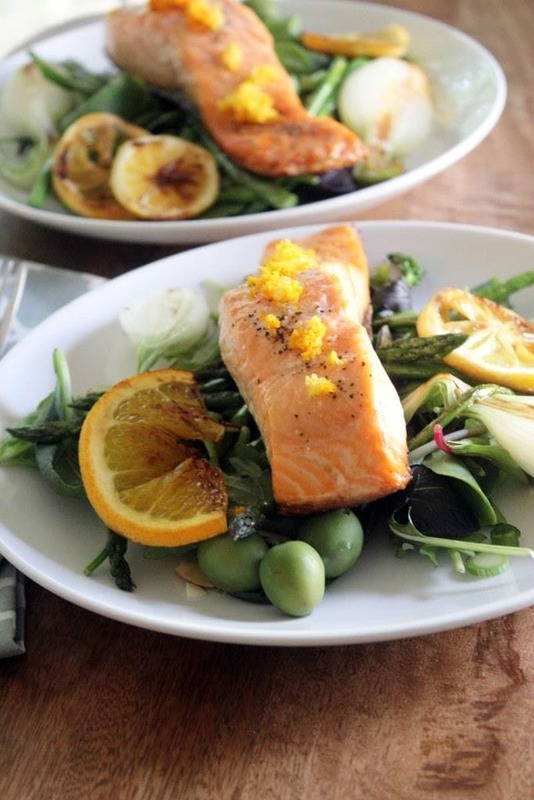 Drizzle lightly with olive oil and squeeze the orange and lemon halves over the salad. Sprinkle with salt and pepper if you'd like. 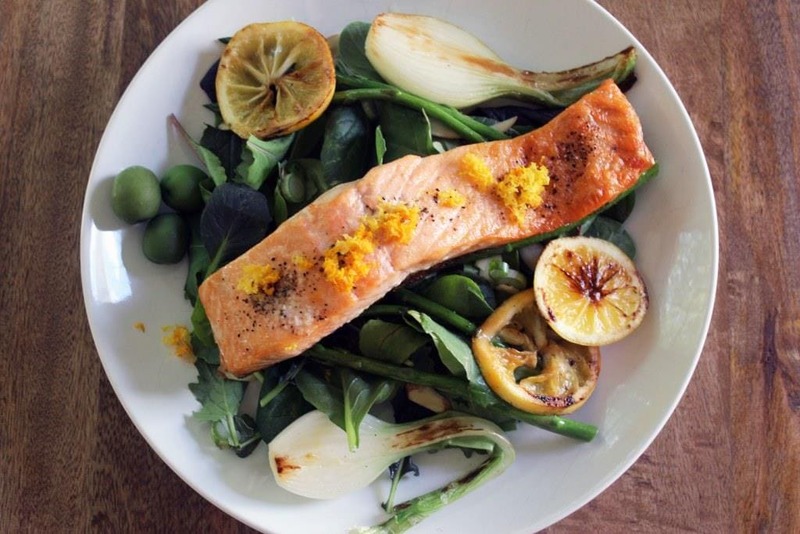 Add a piece of salmon to the top of each salad, and sprinkle some lemon and orange zest over the salmon. 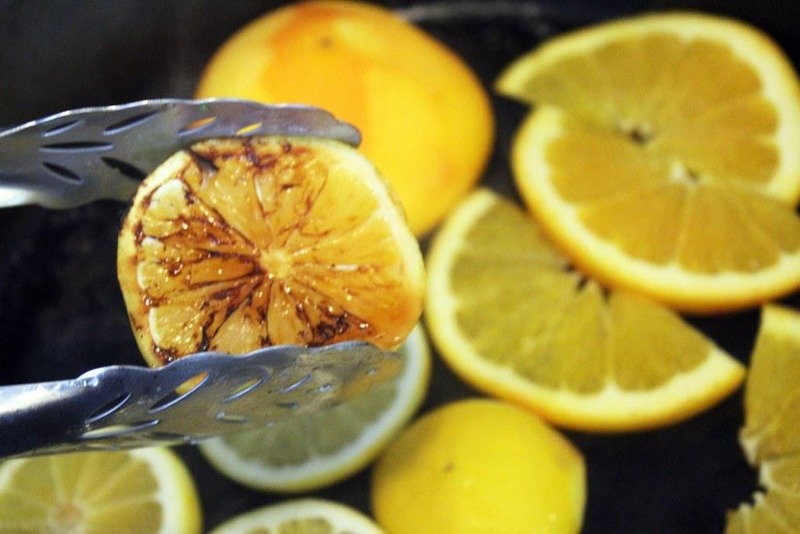 Garnish with the grilled orange and lemon slices. Previous Post: « Sunday Funday!